One thing we’ve learned from Ayurveda is to embrace the oily life. Dating back over 5, 000 years, this holistic medical system loves healthy fat–sesame, coconut to ghee. Internally and externally, Ayurveda recognizes the medicinal value of oil. From aiding detoxification to calming the nervous system. “Ayurvedic” therapies utilize oil in a wide variety of therapy to support the mind and the body. When it comes to treating the eyes, oil can be used as well. In a therapy called, netra basti. Living in the digital era, in which eyestrain is on the rise, we wanted to learn more about the benefits of netra basti. A therapy commonly recommended by Ayurveda Practitioners and Doctors in which the eyes are bathed in ghee to relieve strain and much more. So, we called upon Julie Bernier, owner of True Ayurveda in Malibu, California. A NAMA (National Ayurvedic Medical Association) certified, Ayurveda Practitioner and Yoga Therapist, Julie chit-chatted with us about the what, when, why, how and what if’s of this ancient, time-tested, eye therapy. Netra basti is an Ayurvedic therapy for the eyes. It’s a sort of “eye bath” in which the eyes are submerged in an unctuous substance like herbal ghee. First, I secure a small “dam” of lentil flour dough around both eyes. Next, I fill the dam with melted herbal ghee. Imagine filling a pool with water—it’s a bit like that. Then the client relaxes while the ghee does its work. I have them blink every so often and some practitioners even encourage mild eye exercises during the therapy. After some time, the ghee in the dough dam is removed, completing the therapy. What are the benefits of this herbal ghee therapy? Netra basti is a wonderful therapy for certain eye conditions: dry eyes, blurry or poor vision, double vision, redness, eye pain, difficulty opening or closing the eyes, and falling eyelashes. It’s also good for those who use their eyes excessively—like working all day on a computer. While it’s far more than a beauty therapy, it can make the whites of your eyes whiter. Why should someone consider a netra basti therapy? When it comes to the eyes, Ayurveda brings a level of healing that no other systems of medicine offer. Netra basti is a very powerful therapy. I’ve seen it bring back vision that had almost been completely lost due to macular degeneration! This is one of Ayurveda’s shorter therapy. The ghee is kept in the dough dam for about 15 minutes. 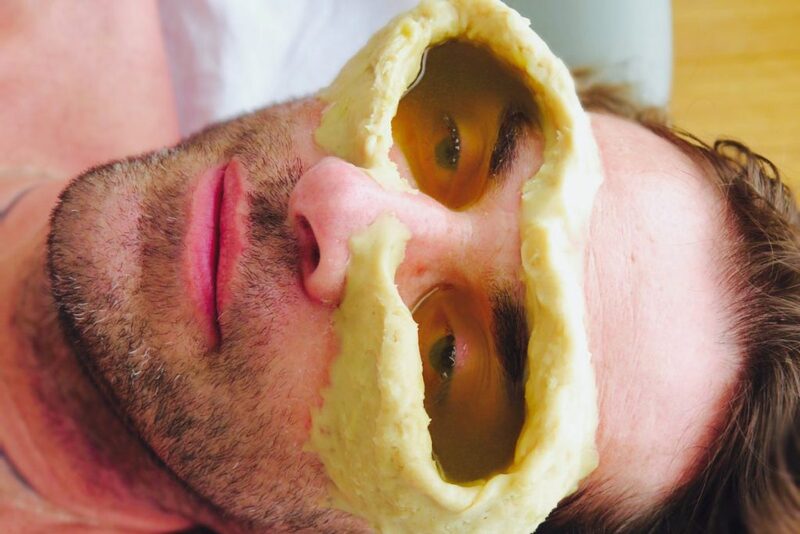 It’s securely sealing the dough dam around the eyes that takes the most time! All in all, it’s about an hour. What kind of ghee is used? I use triphala ghrita for most of my clients. It’s an herbal ghee that has triphala, a 3-herb combo that’s very good for the eyes, cooked into it using a special ayurvedic method. Other herbal ghees can be used, too, depending on the client’s condition. What can one expect during the basti – will it sting? Netra basti is surprisingly relaxing. Most people are a little scared the first time they try this therapy—it’s a totally new sensation! But the slightly warm, velvety ghee is actually quite soothing. It feels nourishing, lubricating, and almost cozy. Most people don’t experience any stinging, but it is possible depending which herbal ghee is used. The stinging is not harmful and goes away after the therapy. If someone is really afraid of that feeling, plain ghee can be used instead. What if someone is scared to open their eyes, will they still receive the benefits? Yes. That ghee seeps in there whether your eyes are open or closed. Ideally, you would open your eyes every so often, allowing fresh ghee in, but only if that feels comfortable. What happens once the ghee is removed? After taking out the ghee I carefully remove the bulk of the dough dam by gently pulling it off — which doesn’t hurt! Then I wipe away any residue with a warm and damp towel. I like to give another therapy afterward, like shirodhara (third eye oil pouring), abhyanga (oil massage) or a janu, kati or greeva basti (local pain therapy on the knees, back or neck) to give the eyes a chance to rest. Otherwise, I have my clients relax for 10 minutes or so with their eyes closed. Will one experience blurry vision after the basti? The ghee will make your eyes feel a little filmy. If you’ve ever removed your eye makeup with oil, you’ll have experienced a similar sensation. They’re usually not blurry, though, and it’s ok to drive home wearing sunglasses for eye protection. How often do you recommend getting a netra basti? As in all things Ayurveda, it depends! In some conditions, it’s given for 5-7 days consecutively, in others, alternate days. In modern American life where it’s challenging to make it to your Ayurvedic practitioner so frequently, netra basti is given at a weekly cadence for several weeks. What else can Ayurveda do for my eyes? In Ayurveda, we almost always work from the inside out as well as the outside in. The effects of netra basti can be amplified by certain Ayurvedic herbs and formulas that nourish the eyes from the inside out. Food and lifestyle are very important, too. The whole body is connected, so the best way to approach the eyes (and any other body part) is by making the whole body healthier. Julie Bernier teaches women the art of self-care so that they feel their healthiest and happiest in their own unique bodies. Julie is a registered Ayurvedic Practitioner and Ayurvedic Yoga Therapist with the National Ayurvedic Medical Association (NAMA) as well as a Certified Massage Therapist. Image courtesy of Julie Bernier.